Cameron Design House recently showcased its iconic Haara pendant in a Parisian-inspired bleu and rose gold finish as part of Paris Design Week. 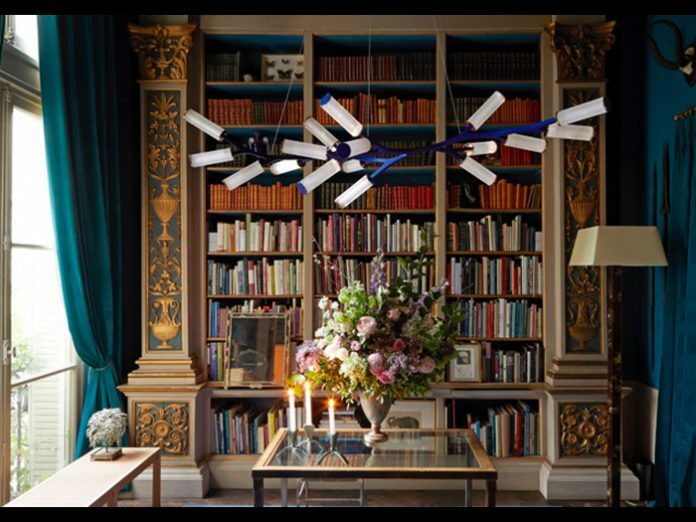 The London-based bespoke sculptural lighting company joined forces with Sacco Carpets and Sarah Magness Design to transform the library of a beautiful residence in Paris. The branching frame of the Haara pendant has a delicate and finely engineered structure derived from close observation of nature.The cylindrical lanterns are assembled from hand-drawn glass and polished brass concealing the lighting element and creating a unique and beautiful lighting diffuser to be admired whether the light is on or off.